Biography & Genealogy: William Walke Brander, Class of 1887. Genealogy: Born Richmond, Virginia, July 14, 1867. Father-Thomas Alexander Brander, b. Richmond, VA; Mother-Elizabeth Walke, b. Richmond, VA; Paternal grandfather-Alexander C. Brander; Paternal grandmother-Louisa Harris; Maternal grandfather-Lewis Walke; Maternal grandmother-Mary Baker. Marriage: never married, no issue. 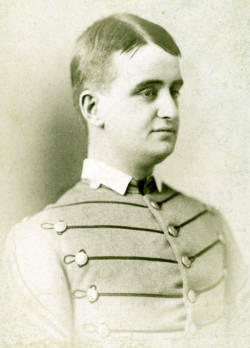 VMI Record: Matriculated 1883, graduated 1887. After graduating from VMI, Brander attended the Virginia Theological Seminary, becoming a Deacon in 1891 & a priest in 1892. He served as an Episcopal clergyman in Virginia and Maryland until he was commissioned a Chaplain in the United States Army in 1901. He served in California, Texas, New Jersey, the Philippines, Cuba & New Mexico, resigning his commission in 1920. Rev. Brander served in numerous counties in Virginia and was the assistant minister at St. James Episcopal Church in Richmond, Va. from 1925 to 1928. William Walke Brander died Feb. 5, 1941 at the age of 73; buried Hollywood Cemetery, Richmond.